Eye tracking is a powerful tool to objectively measure consumers' attention and spontaneous responses to marketing messages. Knowing what people actually see helps advertisers optimize the design and placement of ads. Does your advertisement capture and hold attention? Eye tracking helps you see the answer to this core question, in real time. By tracking the visual behavior of real consumers in real advertising contexts, this methodology adds a wealth of valuable information that conventional research methods normally miss. Eye tracking uniquely provides valuable insights to all areas of advertising- online, print, TV, and out-of-home media. Eye tracking complements the recall method and click statistics in studies of e-commerce websites, banner advertising, email campaigns, electronic newsletters, and in-game advertising. By studying whether or not an ad is actually seen, the advertiser is able to understand how best to communicate with the busy online consumer. 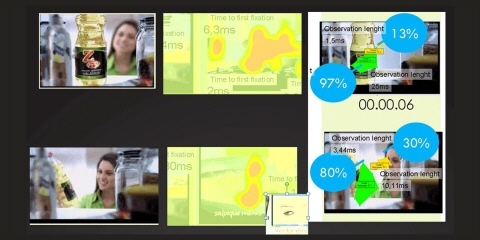 Using eye tracking, you can study how subjects interact with advertising on different screens- traditional monitors and laptops, as well as mobile devices. This methodology helps companies to optimize mobile advertising for limited screen sizes, touch screens, and mobile users' behavior. 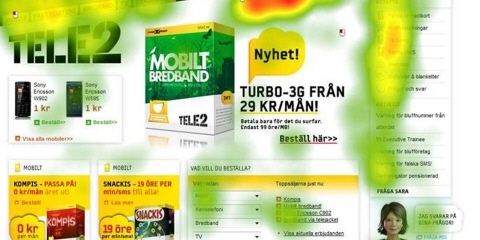 These gaze plot and heat map visualizations reveal that website visitors do not see the special offers, a phenomenon often referred to as "banner blindness". By refining format, layout, placement, and online messaging, advertisers can influence consumer action and increase brand impact. Eye tracking is often used in copy-testing print advertisements during the creative process in order to inform researchers about which choice most effectively catches the eye. In addition, this research tool can be used to test the effectiveness of ads after they've been printed, as a means of evaluating performance in authentic reading contexts. It is useful for all types of publications, including magazines, sales catalogues, invoices, brochures, etc. A well-designed ad can increase attention and interest, plus impact readership, persuasion, and brand recall. Check out the video to learn how eye tracking is used in ad evaluation. 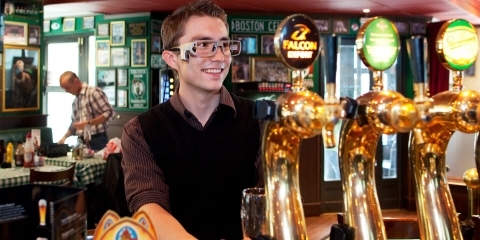 Wearable eye tracking solutions enable the research of advertising displays and point-of-purchase (POP) materials in real-world environments like sports arenas, airports, bars, or grocery stores. For example, this methodology can be used to measure how efficient billboards, LED screens, floor mats, and traditional signage are at influencing the purchase decision or building brand value. This is a video from our client Oculus in Slovenia. It shows how mobile eye tracking is used to measure how drivers are affected by a new way of patented advertising on pillars in parking garages. Participants are tracked with Tobii Pro Glasses while driving in and out of a parking garage. 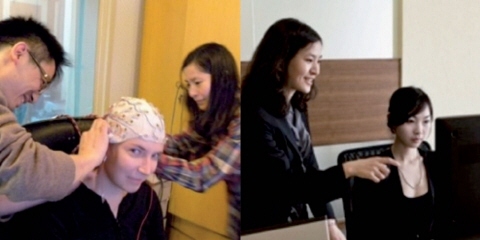 To learn more about the impact scent has on our visual attention and memory, researchers from The Service Research Center (CTF) at Karlstad University conducted an olfactory study while tracking participants eye movements. 100 people were recruited in downtown Stockholm. They wore Tobii Pro Glasses 2 that recorded their visual attention as they walked down a scented section of the street passing Café Löfbergs including its outdoor signage. The study showed that the increased visual attention towards scent congruent information is the underlying reason for both enhanced memory and purchase intention. Participants who were primed with sweet scent showed a 50 percent increased attention towards signs, 27 percent increased recall of signs and a 40 percent increased intention to buy. Television advertisers already know what consumers are watching and when they channel surf. But they do not know what viewers are actually looking at or when their attention begins to drift. 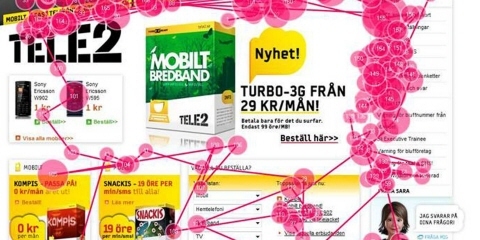 Eye tracking can reveal how different elements in a TV commercial draw or drop visual attention. This research tool enables detailed refinement of an ad before money is spent on development and implementation, and it can be used to measure how viewer perception and behavior evolve during the campaign period. In the modern living room, TV watchers split their attention on many different devices and screens, particularly during commercial breaks. 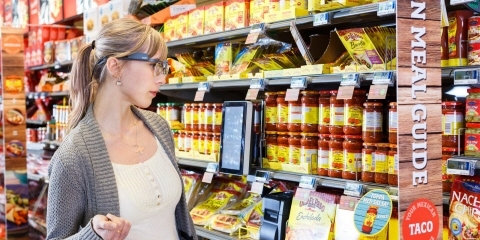 Eye tracking is used to understand this phenomenon in order to help advertisers create ads that hold viewers' attention or that integrate with other devices. Eye tracking offers a unique method to determine whether TV viewers actually look at a sponsoring brand during a sporting event or program. It can be used to complement traditional efficiency measurements of visibility and audience. These heat maps show to what extent viewers look at brands on various items during a sporting event, such as jerseys, balls, and sideline signs.